Schumann, Robert, 1810-1856. Carnaval. Préambule (Sketches). 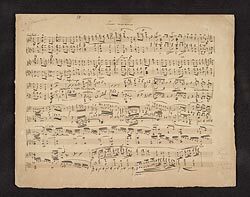 Préambule from Carnaval, and Variations on Schubert's Sehnsuchtswalzer, F24 (fragment): autograph manuscript, 1831-1834.